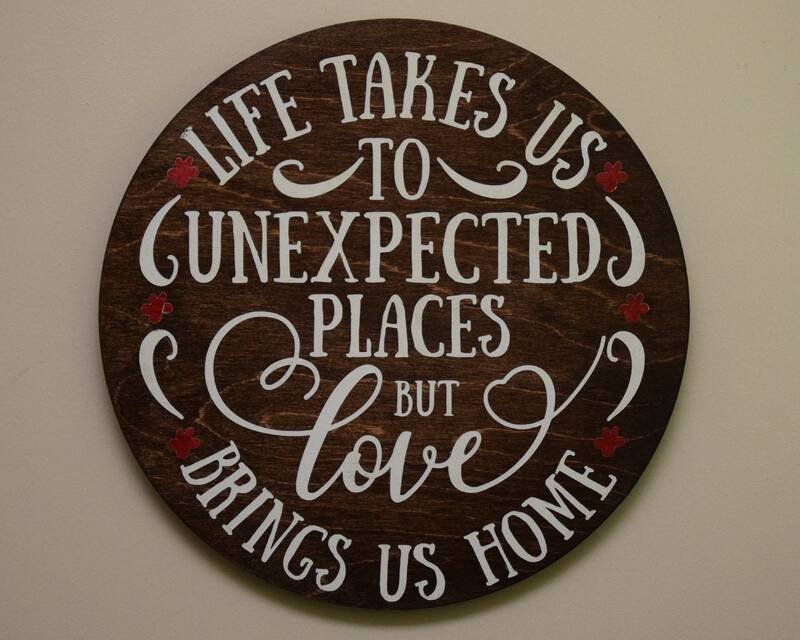 This rustic wood sign that says Life Takes Us to Unexpected Places but Love Brings Us Home in white is the perfect wall décor as a wedding gift or an anniversary gift. This round sign makes a great gift for yourself or someone else. It would look great hanging in the bedroom, entry way, living room, or in an office. This round sign comes ready to hang. Heart sign measures 11.75 inches. Trees are as diverse and unique as we are. Each sign may include knots, spots, bold stripes, and imperfections. Some signs will be lighter, and some will be darker. Like a fingerprint, your sign will be completely one of a kind. Your sign will ship within 7 days after purchase. You can ship our products directly to your gift recipient. We'd be happy to include a complimentary gift note. Please let us know in the notes to seller field upon checkout. This looks Amazing and BTW Super fast shipping! All payments are made through and collected by ETSY, at which time I will promptly ship your order. International customers: Please be advised that when shipping outside the USA, JA Crafting is not responsible for any customs fees, taxes or tariffs that may be imposed on your order. Order fulfillment will take approximately 5-7 business days after payment is received. This does not include time in transit. I will notify you if there are any delays. I offer a full refund for the price paid for an item/items plus shipping "one way" if any ordered shipment does not arrive due to mishandling by the postal service. I will also offer a refund of the price paid for an item/items you may decide you do not want to keep after receiving. Provided I receive the same item/items back to me, shipped by you (the customer), at your expense, and said item/items are received, by me, in the same condition as which they were shipped. I do not offer refunds for the shipping expenses of unwanted items that were ordered and shipped. In the unlikely event you receive an incorrect item/items I will replace the same with the correct item/items at my expence or, if I am unable to replace the item/items, I will refund the full price including shipping. If you receive a package damaged in shipment or a notice of a stolen or missing item or shipment please let me know at jen.quilts79@gmail.com so we can work out a fair refund or replacement and I can file a complaint with the postal service. If an item is damaged in shipping then that item will be replaced with an item as similar as possible as most items are one of a kind. I will ship your order 3-5 business days after it is placed, depending on whether or not the item is made to order. I will mark your item shipped when I have shipped it. I will provide USPS with the email address associated with your Etsy account so they can a send tracking number and shipping updates directly to you. I love to hear your feedback! Please contact me if there is an issue with your order before leaving anything other than 5 star feedback. I will gladly work with you to resolve any issues.